You’ve got some great video resources, but they aren’t bringing you the traffic that you wish they would. “Optimize them,” you’re told. That sounds like a good plan, and it leads you to the concept of video SEO. But what is it, and how do you do it? Here we aim to give you the ultimate guide to dotting your I’s and crossing your T’s on the way to high-ranking video glory. We know you’re itching for the “how” of video SEO, but first we all need to be clear on the “what”—exactly what is video search engine optimization? Truthfully, there is no official definition, because there are actually a number of different interpretations. Your interpretation and the strategy you execute depends on exactly what the result is that you’re trying to achieve. The traditional and probably most popular definition of video SEO relates to having your videos rank highly for a Google Search. This means that the searcher may or may not have intended to find a video with their search—it depends on which Google search area they use. A standard Google Web Search will sometimes return videos embedded within the results page, but only when Google determines that those videos are strong enough contenders to be worthy of out-ranking other content-driven web pages. In these instances, the videos are essentially “forcing themselves into the results page”. 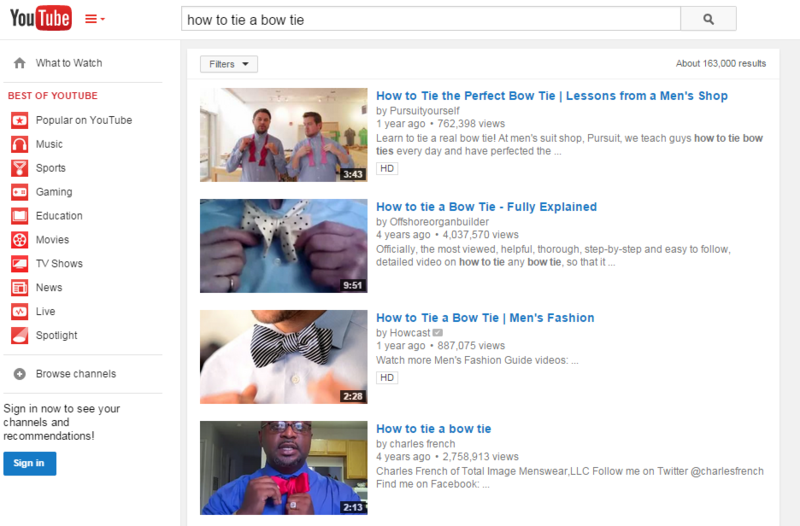 Alternatively, the searcher may be specifically looking for a video, in which case they may use the Google Video search option, which is shown below for the same search term “how to tie a bow tie”. A Google Video Search is essentially the same as applying a filter onto a Web Search, so that only video results are returned. Therefore as we will cover in this guide, it means the SEO for video is a lot like SEO for any other website page. Videos from any source page can rank, so long as Google can see that a video is there—self-hosted, YouTube, Vimeo videos are all within the results. The ranking order for a Web Search and a Video Search are the same. The only difference is that a Web Search will include other types of content. Therefore if you are optimizing for one, you are at least part of the way towards optimizing for both. A different interpretation of video search engine optimization is that it is all about ranking highly within the YouTube results. Considering that YouTube is currently the world’s second largest search engine (after Google), this is a fair interpretation. 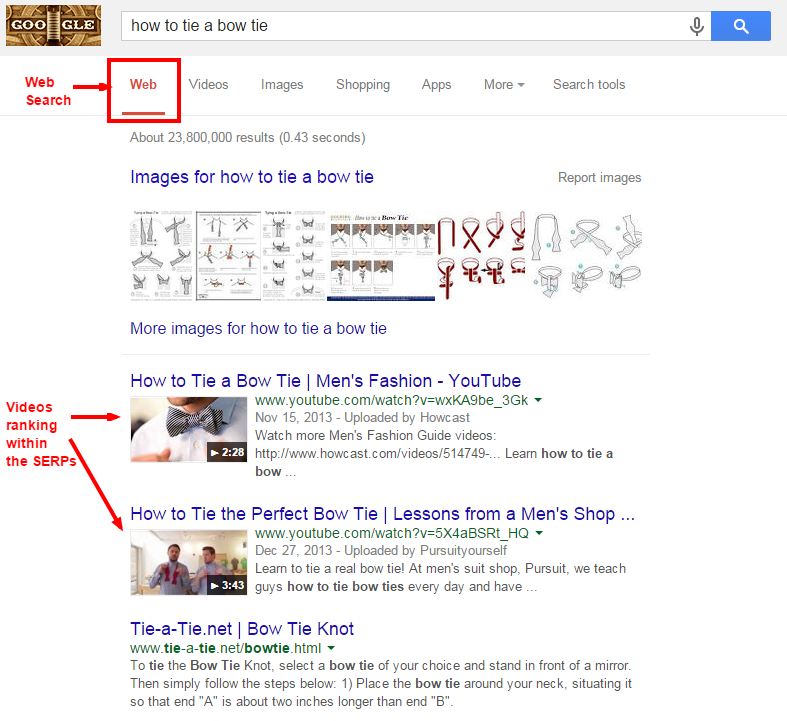 As per the example above, results may be similar to a Google Search but they will rarely be identical. Only YouTube videos will be returned, and the ranking algorithm for YouTube is not identical to Google (despite Google owning YouTube). However, the concepts are very similar and there is a lot of overlap, therefore if you follow the video SEO best practices for one platform, you are typically following it for both. As a rule of thumb, if your major goal is to increase the “Views” on your video, you probably want to optimize for YouTube. This is also likely to be true if you know that you are targeting people that are specifically looking for a video to watch. Examples of this might be aiming to get more views of your music video or a viral video sketch you created. In a business context, videos aimed largely at achieving brand exposure may also fit into this category—i.e. videos that care more about being seen, than about driving a direct marketing action. However, if your goal is more business-oriented and has a marketing purpose such that you want people to end up somewhere other than YouTube, then optimizing for Google Search is probably right for you. For example, if you want to attract people to your website in order to sell them a product, or to fill out a form and contact you, then a visitor that is watching that video on YouTube can be difficult to get over to your website, especially if their session started in YouTube. In simple terms—people on YouTube are typically there for entertainment or educational value rather than looking for someone to do business with. Click—through rates from YouTube to websites are typically very low, whereas a person conducting a traditional Google Search is more likely to be a customer looking for answers. Many of the concepts about what drives views and rankings overlap. In this article, we are going to concentrate on ranking your video on Google, but most of these steps or concepts (unless specifically noted otherwise) also directly relate to ranking on YouTube. It might sound obvious, but you will have trouble trying to rank a junk video that nobody watches. Google cares about serving up quality content, and in most cases will have access to quality signals that tell it whether people like what you have produced. For videos hosted on pages with Google Analytics installed—time metrics showing how long people are spending on the page. Link attraction—a good video may be linked to from external websites. These links are a tremendous driver of rankings in both natural SEO and video SEO. Don’t make the mistake of trying to fake your metrics—you’re a video content producer, not an experienced spammer capable of out-smarting Google. You can, however, execute strategies to drive those metrics up. Encourage conversation in the comments through debate, or even controversy (so long as it is not going to damage your brand). Group your videos into a Channel that attracts Subscribers, winning you repeat viewers. If you’re hoping to rank your own web page for this video, you have a much higher chance of doing so by hosting it on your site, rather than uploading it to somewhere like YouTube or Vimeo and then embedding it on your site. This is because uploading the video to those platforms is effectively the same as giving them your content. As highly authoritative websites, there is every chance they will out-rank your website with your own video, with your own site being seen as nothing more than a copy-cat of that content. The exception to this is if you set your Video on YouTube to Unlisted or Private, as this will stop it being indexed in Google. A great alternative to having to rely on the likes of YouTube or Vimeo to host your video, are Business Video Hosting services. Our favorite is Wistia—the video player is nice and clean (particularly the paid version; the free version contains a Wistia banner). It has excellent back-end settings for easily setting video tags and creating a Video Sitemap, along with nice analytics if you want to get serious about how your videos are being watched. You can also serve videos from a CDN, such as Amazon’s CloudFront, and then use your own player. If you do this, a clever trick is to create a sub-domain on your site, such as videos.mysite.com, and create a CNAME record pointing that sub-domain to your video location on the CDN. This will give the appearance that the videos are hosted on your site, a bit like “white labeling” the CDN service—although ensure your CDN does support this first. Regardless of where you host the video, all platforms will give you the ability to cover the video SEO basics and set meta data. Video Titles should be relatively short and catchy. Think about whether that title can be read on a small screen with limited width (eg a phone). Do include a popular keyword relating to your subject. Do not try to force in any more than one or two keywords naturally. Aim to keep it under 65 characters, to ensure the full title is seen in the SERPs. Video Descriptions should again try to blend in a keyword or two naturally. Get to the point quickly, as many of the places the video can be displayed (not just Google) will cut the description off after about 20- 25 words. Video tags allow you to categorize your data. Be both specific and general with the tags—for example, a video on SEO might be tagged “SEO” to be specific, but also “marketing” to be more general. Don’t stuff it with many variations of similar keywords—using the same example here, “Video SEO” might be a good tag, but including “SEO for Video” and “Video Optimization for SEO” is getting spammy (see what we did there? ;)). Aim to include any brands, people or locations relevant to the video too. It’s a relatively simple and straightforward step, but you’d be shocked at how many sites with videos haven’t bothered to do this. Be as comprehensive as you can in filling out the available tags for each video (some of your meta data will already do this for you). Submit the Sitemap via Google Webmaster Tools, and once it has been picked up, be sure to check for any errors or warnings. Hint: if you are using Business Video Hosting like Wistia, it can generate this XML Sitemap for you. By default, it will then host it on the Wistia site (eg http://app.wistia.com/sitemaps/12345.xml) which is convenient, particularly if you are creating or updating videos in your account regularly. You should still then specify this Sitemap location within you robots.txt file and submit it via Google Webmaster Tools. This is a crucial step for every video. No matter how far technology advances, Google will always have a limited ability to accurate determine what the content of a video relates to compared to its ability to understand text. Therefore, a full transcription of your video is essential. If the video includes important written text within slides, this should also be placed on your page as text, so that Google can crawl it. If Google isn’t sure what the video is about, it can’t rank it for something. The written content also gives you greater ability to rank for longer tail keywords from within that content. If you insist on hosting the video on YouTube, but are embedding that video in a separate web page that you wish to rank highly, do not put the transcription on YouTube. That transcription is more likely to assist the YouTube page in ranking, rather than your own page. Put the content on your own page. We pride ourselves on being the leading video transcription services company around, trusted by leading SEO industry experts like Moz.com. Getting started is extremely easy, takes less than 30 seconds, and transcriptions for as low as $1 per minute is incredible value. Hint: Keep in mind that the average human speaks between about 125-150 words per minute. Therefore a clever way to get quality content for your website is using transcription services. Got old videos with good content? Transcribe them to get it into your site for added content value. Or do you have access to someone that has excellent knowledge on a topic you want content for, but they are too busy to or too expensive to write an article for you? Have them speak instead! Perhaps interview them, or with their permission, record a phone call. At only $1 per minute, you could end up with hundreds or even thousands of words of expert content written up for just a fraction of the cost of a copywriter. Give the video a place front and center on the page you are putting it on—definitely above-the-fold. This gives it added SEO importance, while of course also ensuring visitors actually see it and watch it. Regardless of where you end up hosting your video, you will likely be placing it into your website using some kind of embed codes. If available, try to use an HTML5 player as this can be recognized by Google crawlers and is typically more portable across devices. Avoid using iframes wherever possible, as Google has trouble crawling the contents of frames and may not recognize that there is a video on the page. Most paid Business Video Hosting services will have a clear SEO embed option, so look out for this. Again, we like Wistia because the SEO embed option includes Schema.org markup and OpenGraph protocol. Since you’re aiming to rank a page, you need to optimize the entire page in the exact same manner as when performing search engine optimization for any other content type. SEO for video is no different—it’s the same algorithm assessing the page. Keyword research use the Google AdWords Keyword Tool; however, be sure to include keywords that tend to return videos within a standard Web search. 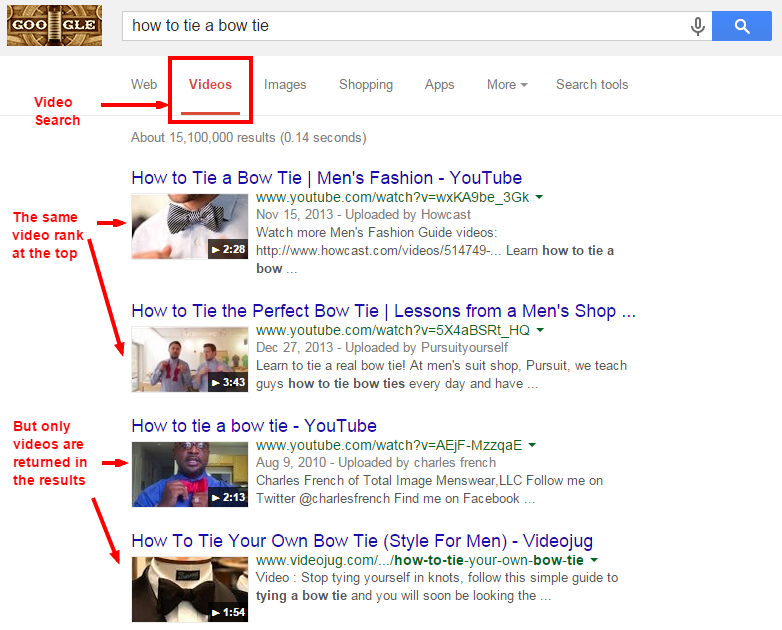 You can test this by actually Googling each keyword you’d like to target and see whether other videos are showing up. Keywords that frequently describe common video content—such as “how to”, “guide”, “review” and “tutorial”—are good choices. Optimize the page Title, Meta Description and set a H1 heading using a major keyword in a natural manner. Also remember that the taxonomy of your site (ie the way it is organized) is relevant. So, ensure your site organizes the video content thematically, so that he videos are living alongside and linking to/from related content in your site. If your video is about shoes, place the page among the other shoe pages, not in a general “videos” section that contains videos on everything from shoes to sunglasses. Typically it is best to limit one video per page, for a page that you wish to rank. The vast majority of pages ranking with videos, only have one video on that page. Just like standard SEO, links are the juice which feed authority to a page and give it the power to rank. Videos can be a great way to attract links, which takes us back in part to the first point about Quality. 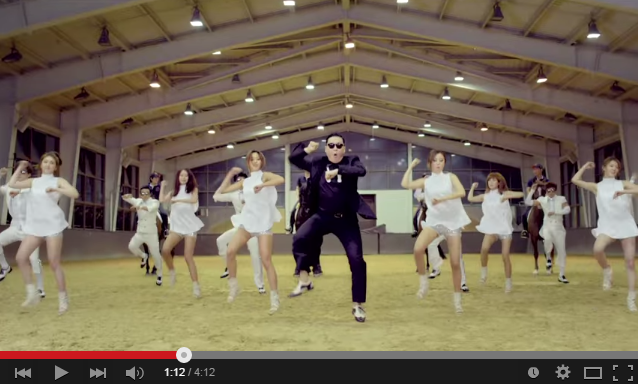 Good videos will attract links—think about what makes your video content truly remarkable. As a starting point but not a comprehensive guide, is it any of these things? Highly educational and unique. Even an excellently executed video teaching on a topic, might be the 10,000th video created on that topic. Shocking or controversial—but still on-brand to your demographic. Thought-provoking, if relevant to your demographic. Interesting to a potentially wide audience. These types of concepts relate to the broader topic of Link Bait, which is a large area in itself. Suffice to say now, attracting links to video page is a significant driver of rankings. Hint: Linking to the video page within your own site is important also. If the video page is buried deep within your site and rarely linked to even by your own pages, it will not receive much PageRank flowing through the site. Plan the hierarchy so that the videos you want to rank are closer to the top, linked to by other important pages in your site. Depending on the actual content and how you feel about it being used on other websites, if you do allow it to be embedded on other sites, this can be a great way to get links back to your site. However, if you do this, you must ensure that the embed code people use references your video page, not the host page like YouTube or even Wistia. The problem with enabling this from YouTube is that it doesn’t get you backlinks, it gets backlinks for YouTube. 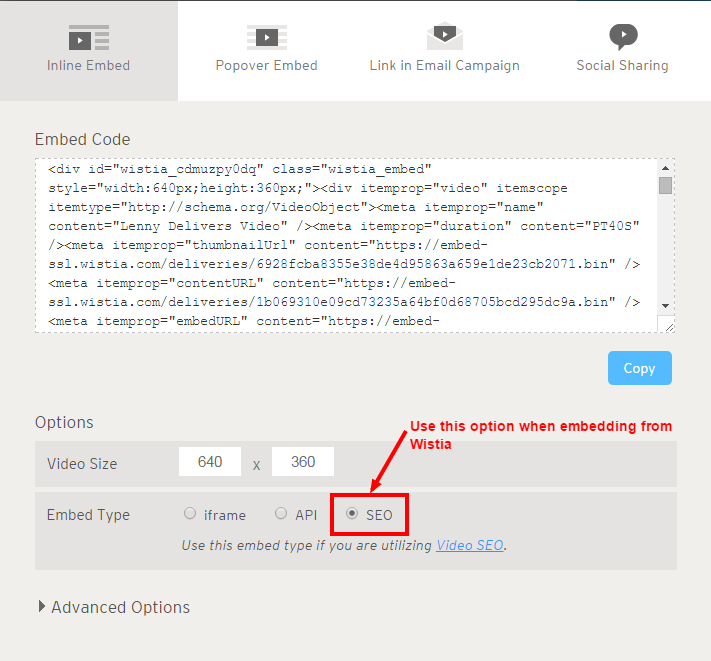 If you use a paid service like Wistia, you should customize your embed button to include backlinks. 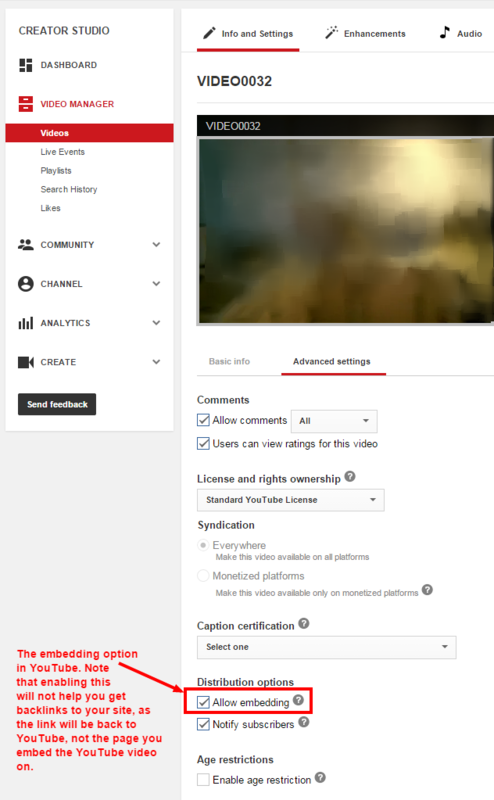 This is under the “Customize” menu for your video, inside the “Social Bar”. This means that if someone chooses to re-embed your video, an attribution link will be included back to your web page, which is exactly what we want. It’s a common question, but there is no straight answer because there are so many factors involved. If the website you are hosting the video on already has good authority with Google—and you follow these steps above—things are likely to get picked up quickly and your video could be ranking for niche terms within weeks. How it ranks for more competitive terms very much depends on the competition it is up against. Remember, your video will need some time to accumulate quality metrics from viewers. For more information on the importance of video SEO, check out this blog post by Simple Strat – 6 Factors That Will Affect Your Video SEO in 2018 and Beyond.